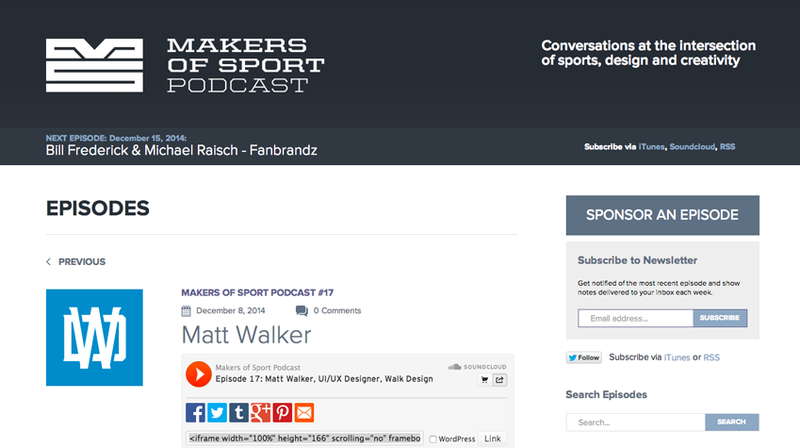 With many of the American sports, other than the MLS and MLB on their close season break, we took the opportunity to speak to Matt Walker, Senior UX Designer at Sports Illustrated. We learn more about their design process and imminent plans to redesign their site (SI.com) using the principles of UX/UI design. Current Sports Illustrated website (SI.com) which is being revised by Matt and his team. I myself am a Senior UX Designer for the SI.com website. I started here last August having previously been the Design lead at ESPN Fantasy Sports for 8.5 years. I work on our website and mobile products team. 2. 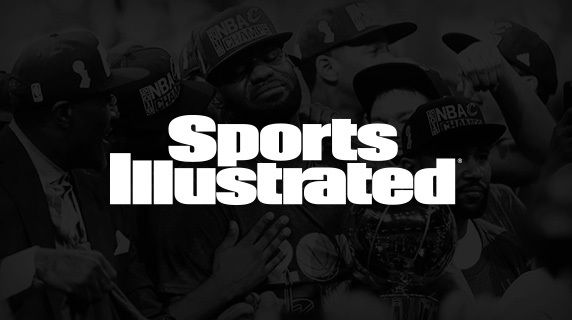 How big is your design team at Sports Illustrated? I can only speak to the SI.com part of Sports illustrated. We are currently at 4 members of the team. As a company we have taken a stronger approach to our online efforts than we have in the past so as we grow the online offerings, I am sure the product and design teams will as well. 3. How has UX/UI impacted upon the development of Sports Illustrated in terms of visits, engagement and subscriptions? Currently we have spent the better part of 2016 working on a complete redesign for SI.com. We expect a launch later in the summer before football at this time. I believe the reaction will be very strong and the numbers should increase over time. Since we have been such a print focused company it might take some time to condition our users to a new site and direction, but I believe we are laying a great foundation for 2017 and beyond to really create the types of online experiences we as a team are capable of. 4. What impacts your decision to make design changes? Do you have analysts, or do you use insight tools beyond Google Analytics? We have a number of things that impact design changes. First and foremost our main catalyst would be to clean up some backend legacy code that we believe needs our attention. We have a great new team of developers that are really fantastic and we are relying on them to make sure we bring everything up the high standard we believe fits a brand like Sports Illustrated. The other things we rely on is our analytics team, our editorial staff that is tasked with making great content and the product team as a whole that has a strong vision of where we believe the web is today. Right now our focus is to bring everything up to the level we expect, then we will rely even more heavily on our metrics and user testing to drive us forward. 5. Are there any particular UX tools you would advocate for designers to use? As a team we rely on Sketch, Invision and a number of other tools to create visual concepts for the team to focus on. I myself am still a strong advocate of Photoshop and Illustrator. We are always looking at new technologies to see if it will help us grow. The main thing is that the developers are getting the assets they need from us in the way they are most comfortable implementing them. 6. What is your driving motivation behind what you do as at Sports Illustrated, and what continues to fuel your inspiration? As a senior member of the team, I can say my main motivation is sports fans and how they consume content. As someone who has loved sports all of their life and also loves solving problems, it gives me great joy to have an impact on how millions of people could potentially get their sports content easier and in a better way. Having worked at ESPN Fantasy for so long, I loved to talk to folks on how they used our Fantasy products with such passion. Even just in everyday life I could hear people discuss Fantasy sports or the product I worked on, and it made me very proud and excited that I could implement their ideas and even improve the way they enjoyed live sporting events. The last product I worked on at ESPN, the Tournament Challenge app, had an instant impact on how people I spoke to every day got to enjoy the NCAA tournament. I thought that was as rewarding as it gets. I believe we are going to have the same type of impact here at Sports Illustrated. We have a great team is really good, but more importantly really cares about what makes products great. 7. What key tips and advice would you give to aspiring designers looking to succeed at the highest level? What I always tell young designers is you really have to love it. ALL of it. Take advantage of being young and ask as many questions as you can, and work as many hours as you can to keep getting better. Younger designers can afford to sacrifice pay for great experiences or to take chances that you may not be able to do later. My first 5-10 years in the business were spent working tons of hours and creating the core philosophies that would shape me to this day. As you get older and life gets more complicated (family, house, bigger bills, etc.) you will be glad that you built a great foundation when you were younger. 8. Do you envisage any significant developments in the design industry over the coming year? Since this is my 20th year in the business I tend to take a very cyclical view of design. Anything new that comes along tends to be reminiscent of something that I have encountered before. I worry less about new developments coming and more about keeping things simple and easy to use regardless of changes to the industry. I guess that officially makes me the old cranky guy! 9. Finally, for our UK audience. Why should they subscribe to Sports Illustrated? I would say you should visit SI.com in the coming year because we are going to mix great story telling in the world of sports along with a growing digital presence that will allow you to follow sports with a focus on the user. We are not in bed with the sports leagues so we don’t have any interests other than that of the user. That is getting harder and harder to find in sports. Senior UX/UI Designer with 20 years of creating rich and award winning interactive experiences across multiple platforms and devices. His creative work has been rewarded with multiple awards, including a Webby Award, and he also helped bring ESPN Fantasy Sports to the number one Fantasy platform in the world. Matt’s success is a product of his passion for architecting effective product and experience strategies, applying analytical and creative thinking to ideation, evaluation, and end-to-end design execution. You can follow Matt Walker on Twitter here and connect with him on Linkedin. From time to time I get questions from design students about my experience within the design industry and to see if they could get some insight that they can’t always get in school. In this case, after answering Jim’s email, it occurred to me, that others could find some of this answers valuable as well. So I posted his Q&A online in case anyone is interested. I answered your questions as best as I could. I hope this is helpful. Feel free to reach out to me if you have any other questions or I didn’t answer this as well as you had hoped. P.S. My answers are in red. Thanks again for taking the time to answer these questions for me! I am Photoshop CS5 certified and have run the Twitter account, @GridironGraphix, for two years now. I edit photos of NFL, college, and high school football players and want to turn this into a career. I would love to combine my love for sports and my skill of graphic design/Photoshop work into a marketing job with an NFL team. I saw on your Twitter profile that you do sports product and logo design for ESPN. How did you prepare for this career? I was always into drawing as a kid; however, I only really drew sports stuff. Looking back, it was the logos and uniforms and face masks, etc. that I really loved to draw. I took a 5-year art program in high school and it was the only thing I really cared about in high school other than sports. When the time came to look at colleges, I wanted to play football but the only way I could get into college with my grades was through art. However, there weren’t a lot of options for a serious artist who wanted to play football (I could only afford a state school in NY). I went to FIT, which has an incredible art program for Illustration. I later changed to an Art Design major since it was the 90’s and computers were more of an ad design thing at the time. I graduated and looked for work as a graphic designer in any position I could. I always played sports as a hobby or volunteered free work whenever I could to build up a good portfolio. When the opportunity came up for an athlete (Albert Pujols) who needed work, I was ready. What kinds of tasks do you perform on a typical day or week? I was the designer for ESPN Fantasy for 8.5 years. Currently I am the VP of Creative at a startup tech company, which isn’t about sports. In both cases my workload is very similar. I solve problems. Whether they are branding problems, UX/UI problems, conversion problems… you name it and I try to solve them. Design is design no matter what the medium or the platform. I would like to think at this point in my career, my focus is much less aesthetic than functional. I enjoy jumping in and worrying about the look and feel, but that is the final piece of the puzzle. I pick an aesthetic solution that helps me solve the business problem. I use your typical software suite: Photoshop for most things, but Illustrator is my personal favorite of the two. Being a logo guy, every logo has to be made in Illustrator. Also, I feel like I can create more things organically in Illustrator, but that’s probably because back in 1994, that is the software I learned first on (yes, I am really old) ☺. What do you like best about this job? And what excites you the most? What are some of the more difficult or frustrating parts of this job? In my experience, there are a number of challenges that make this business hard. In the case of working at ESPN we ended up having so many cooks in the kitchen it was hard to solve problems when all of the people giving input aren’t on the same page. Rather than focus on all of the challenges, I can tell you some solutions that will fix a lot of the problems. Try to always identify the key decision makers. Make sure you communicate with them early and often to understand all of the challenges of the task and what the end result needs to be. One of the biggest places where designers fail is they are too worried about making something that they like, but that is not their job. Their job is to use their expertise and skills to help others (who are paying money) make their visions become a reality while integrating their own sensibilities where needed. The biggest problems designers face is typically we are not great communicators and we also do not understand how to create value. Being a good communicator is key because when you present your work to the key decision makers, it should be a smooth process of just one or two revisions, but you were explaining the direction throughout the process. When you see designers that have to redo work 4 or 5 times, typically its because the client voice was not being listened to and your ideas for execution weren’t vetted before you jumped into executing them. All kinds, that’s what designing is. Remember, design is how something works, not how it looks. You are constantly finding new hurdles every time you start a project and new ones appear with every direction you decide to take. I liken it to fixing something in your house. You may think you are fixing a window, but when you open up the wall and look inside you almost always find bigger issues that need to be fixed. When you start asking people questions about a project, you almost always have bigger root issues about their business or processes that need to be addressed to solve the problem. What type of characteristics does a person in this job need to have? First and foremost, you need to love what you do, ESPECIALLY in the first few years. I think the youngest designers need to probably do a lot of either free work or work for next to nothing so they can get opportunities they probably haven’t earned yet. It’s a labor of love. Experience is your pay, don’t worry about making money at first because the key thing is learning how to work with someone else’s product and their vision for it. Anyone can make something they like, a true designer makes things they like within the confines of the clients vision, that is where the rubber meets the road. Secondly, you need to have a thick skin when it comes to your work. You need to be curious, you need to have an overwhelming desire to figure out how people created the amazing things they created. You can always get a brainless job doing production work if you want to, but in my opinion, to do this job right, you need to want to be great, just like in sports. You have to be self critical at all times so you can keep improving and so you won’t be too shocked when someone rips your heart out and spits on it because they don’t understand what we really do. What kind of hours do you work in a typical day and week? It all depends. I know folks who work 9-5 and play on the company softball team, intramural golf, you name it. Typically they don’t go very far. I also know of people who have full time work and go home and have thriving side businesses and work until 2 or 3 every night after work. It’s like anything: you get out of it what you put into it. If you love it and you need to be great at it, you will do whatever work needs to be done and never go home until the work is done. I have had jobs where I would stay 8-9 hours a day and we did great. I have had jobs where it’s crunch time and I have worked 12 hours days for a few weeks. One of my first jobs I literally slept at work 4 nights in a row and never went home. You have to love it, because their always-tight deadlines and sacrifices will have to be made to accomplish your goals. How does your career affect your lifestyle? Is there a good work/life balance? Can you work from home/outside of work? Much like the answer above, it’s up to you. If you are smart, you can manage to have a great career and still have many outside interests. Many companies let you work remotely; however, in the case of working for a team, in my experience you have to be onsite. However, every job, every team does things their own way. I work a ton of hours, but I also coach my kids’ teams when I can. Personally I always think to work like hell when you’re young and building your career foundation so when you get older and have a family or just get a bit burned out, you can slow down a bit. But everyone is different. What type of entry‐level job/internship do you think would offer the most learning opportunities for I’m trying to accomplish with an NFL team? I have never worked in the NFL, so I do not know. I would say to keep your eyes open on job boards, particularly sports centric ones that you may need to pay for, and just be vigilant. Either way, I would say focus on design in general, not just sports. You want to be well rounded. Also sports in general can be a tight knit community, so keep your eyes open on all sports, not just the NFL. Once you get into sports and have a reputation, it’s easier to move around. I hope to one day do graphic design or Photoshop work for an NFL team. To your knowledge, what types of advancement opportunities are available for an entry‐level worker in this career? I am not really sure about the NFL per se. I would say that starting there is good, because typically teams do not pay as much as other industries. So if you are starting out, the salary might not be as important as if you had a family or more bills. I wish I could help out more my your NFL focus, but hopefully some of my other points can be of some help. 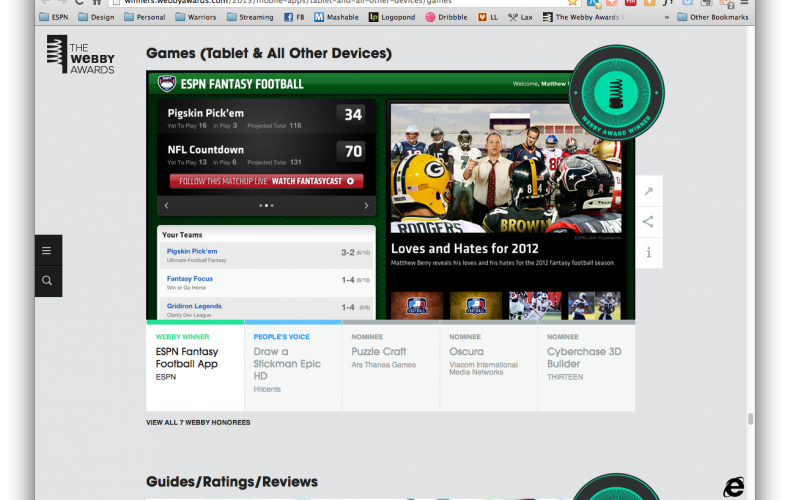 I am very happy to announce that the Fantasy Football iPad application that I designed won a prestigious Webby award. I worked hand in hand with our development team to take a pre-existing Fantasy Football UI that existed for our desktop and refine it and make it it more logical and mobile friendly. The product itself took quite awhile to develop, but it will lay the foundation for Fantasy Sports UX for the future. In this talk Matt will talk about the challenge of working with large scale brands like ESPN (and some of Matt’s other clients). 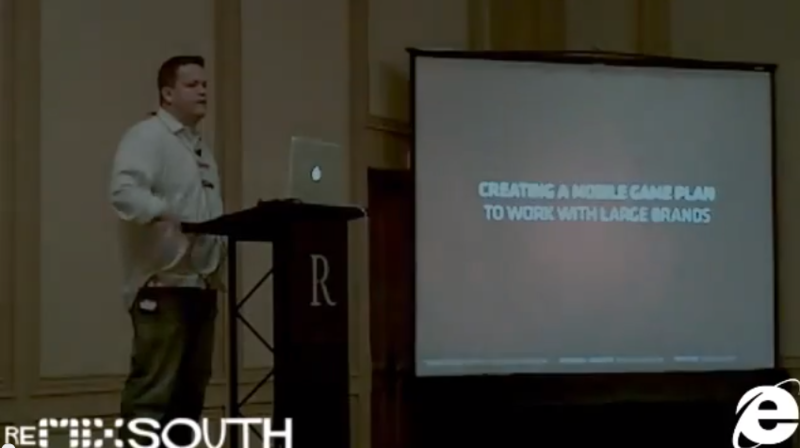 Matt’s had over 16 years of experience with large brand, Matt’s encountered potential issues you need overcome and consider when putting them into the mobile space from a content and execution perspective. Matt will also go into the challenges responsive design and other popular design trends could pose for large scale companies and I will use my new FFL iPad app as an example of how to solve those problems. 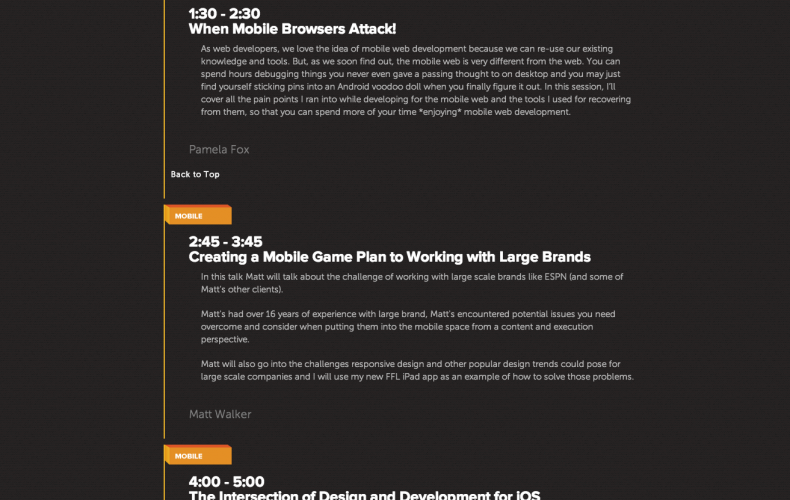 Make sure to make plans to get to Atlanta, GA this October to catch me in my first ever appearance as a speaker discussing my thoughts on Mobile Design. 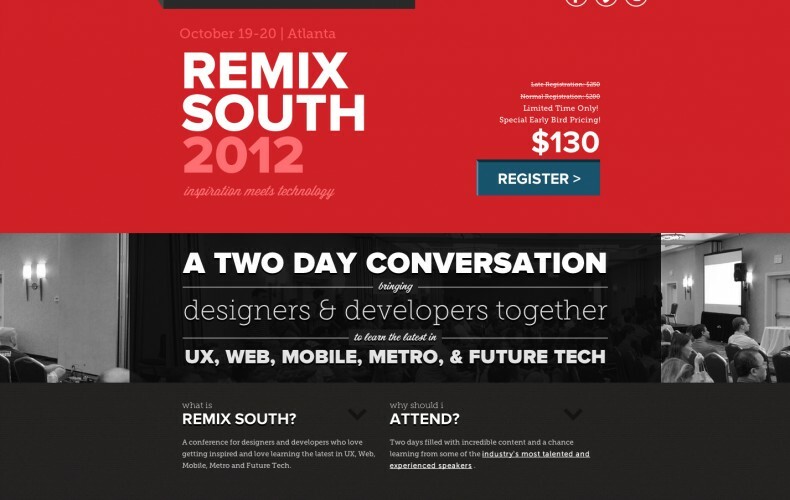 The conference runs from October 19th-20th and I am scheduled to speak on Saturday the 20th. If you’re lucky I may just freeze up completely which would be worth the price of Registration itself. 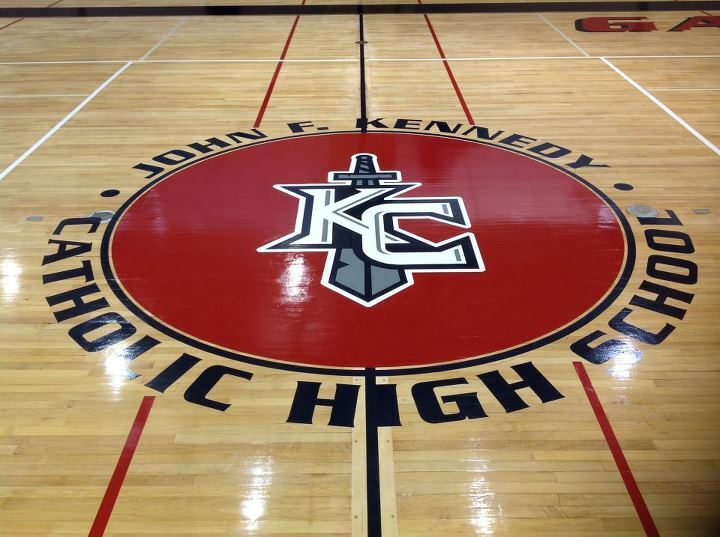 We are very proud to have the logo we designed for Kennedy Catholic to be imprinted on their brand new gym floor! Earlier this year we went contacted by The College of Notre Dame of Maryland to help them transition to their new standing as a University. The name of the school changed to “Notre Dame of Maryland University”. In partnership with the new name the school was looking to make some adjustments to their athletic mark as well. Sadly after weeks if working with the school and having some good success, the project was tabled in favor of something more in line with what they were currently using. However, we are very proud of the project contribution from our end so I wanted to post this as an example of the kind of work we can do.